Known as the Legend, Arapahoe Basin is nestled high along Loveland Pass about 68 miles outside of Denver, Colorado. Having been in operation since 1946, the Legend offers some of the highest skier and rider accessible terrain in North America where half of the mountain sits above the timberline with skiing and snowboarding through late spring and early summer. A-basin features a vertical rise of 2,270 feet and a summit elevation of 13,050 feet with 960 accessible acres and an average snowfall of 350 inches. The terrain is rated 10% beginner, 30% intermediate, 37% advanced and 23% expert with the signature run Pallavicini as one of Colorado’s longest and steepest trails. A-Basin is a great option for all ability types offering up some excellent expert terrain combined with long wide groomers and a learner’s slope for beginners. With 109 trails and eight chairlifts, the ski resort sits at the base of the continental divide and has one of the highest base elevations in Colorado. Terrain options are plentiful with high-alpine bowls, tree glades, chutes, wide-open groomers and amazing off-piste options. The East Wall contains some of the most difficult terrain within the resort boundaries. Skiers and riders can access the upper East Wall, home to double-black expert terrain, via a steep hike or traverse to the lower East Wall without hiking. 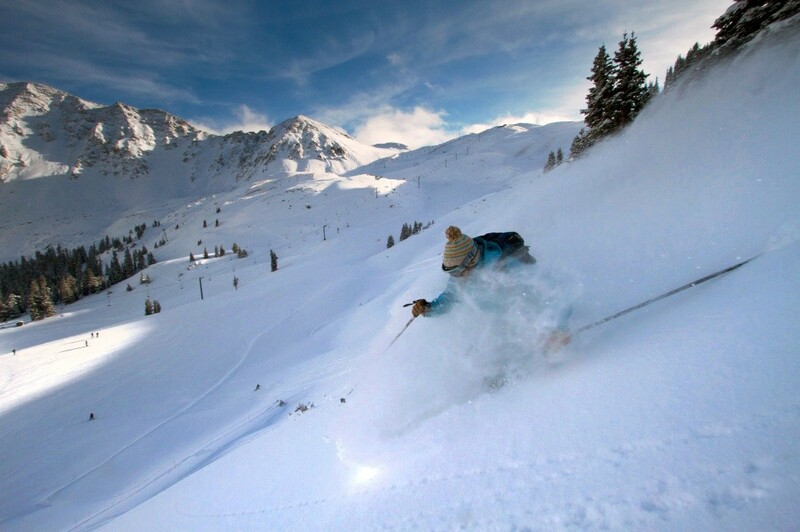 Arapahoe Basin is home to some of the highest skiable terrain in North America. The current A-Frame lodge located at the base area was once used as a missile testing facility but now offers up multiple dining options for visitors. It's snowing in Arapahoe Basin Ski Area 2" of fresh powder is calling.